Considering that art comes in every shape and form, deciding what kind of art you should buy for your space can be daunting. Here we’ll address choosing the right style of art for your specific room style, whether you should buy original art or reproductions, and whether to go big or create a gallery wall. What kinds of art do you like and what interior design style will your room have? In our online art consulting practice, we use a visual quiz to pinpoint the style of art a client likes. Here is a short list of artistic styles to consider when establishing your taste: painterly, street art, abstract, minimalist, landscape, portraiture. Interior design styles have some overlap with artistic styles, but the rules for matching styles vary wildly, and, as is always the case with anything related to art and design- there are always exceptions. A minimalist artwork works well in a minimalist room, however, a large painterly work has a perfect stage in a sleek minimalist or even industrial room. Traditional, French country or Coastal interiors crave art with movement and body, muted and pastel colors, and delicate linework. Bohemian atmospheres are well suited to abstract work, while a weaving will feel more at home in a rustic room. While we almost always recommend purchasing original art, there are a few exceptions. Print reproductions tend to be a better option in a bathroom or a child’s room, in a busy entry way and any location near the stove. Sometimes prints are a solution when the artist you love is outside of your budget. Artists offer signed limited reproductions which are signed by the artist, and have the potential to increase in value, as well. The best investment, of course, is original art. So for every other room in your home, get the real thing. One large artwork or a gallery wall? Consider your interior design style, your art collector style, and your personality. One large artwork is a better fit in a minimalist space that has a high number furniture and accents, while an organized configuration of smaller work in matching frames can as personality to an otherwise minimalist room that needs a little oomph. Conversely, a shabby chic interior is better suited to an eclectic grouping of art hung so that it meanders and climbs. This is also where personality comes in to play. 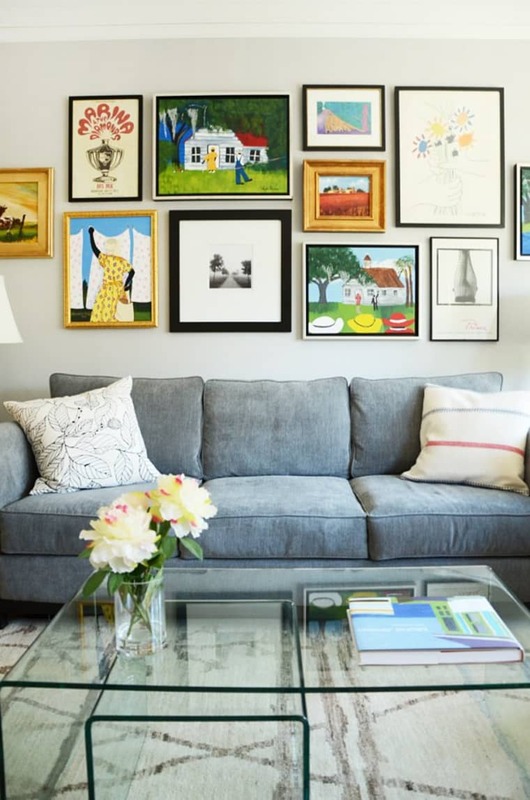 If you enjoy adding to your art collection frequently, then a gallery wall is the way to go. When your art and your decor fit your personality, everything goes. Which comes first, the design or the art? We recommend starting with the art you love and building your room around it. It’s easier and more rewarding to start with the art and discover a couch that works well and to add accents inspired by texture and color in your art, than the other way around. Looking for art to match the couch is an unpopular approach that is also not as fun. Any way you go about it, we are here to help. When you register for our Online Art Consultation we’re here to guide you when in selecting the best art for your space. When it comes to selecting the best furniture for your art, our designer is also available online or in person.